I really thought Florida was totally flat until Monday, when I first set foot in the Torreya State Park area (between Panama City and Tallahassee). Hiking along the nearby 3.75 mile "Garden of Eden Trail" was amazing - I really did not feel like I was in Florida. Across a sandhill, through a slope forest, across ravines, and through an upland mixed forest that resembled middle earth, with a cherry on top: a breathtaking scenic bluff overlooking the Apalachicola River. 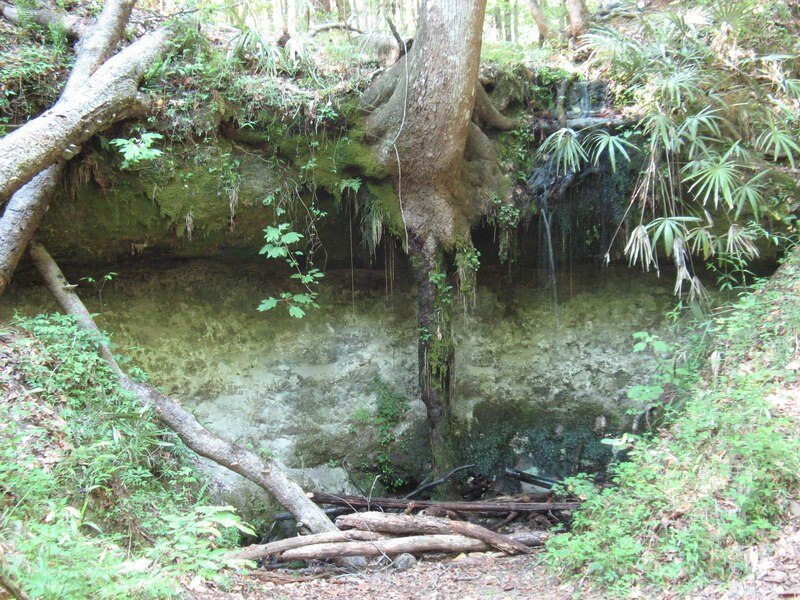 Want to work up a bit of a sweat and actually hike in the sunshine state? 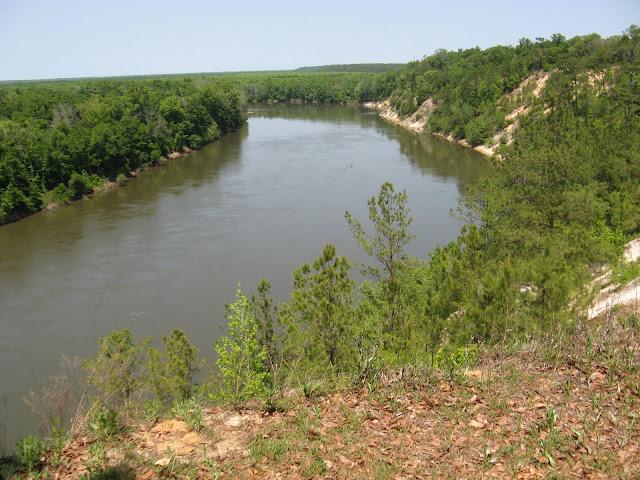 I highly recommend seeking out the "Apalachicola Bluffs and Ravines Preserve." Near the top of the overlook, a giant lizard lives inside the hole in the middle of this crazy tree. 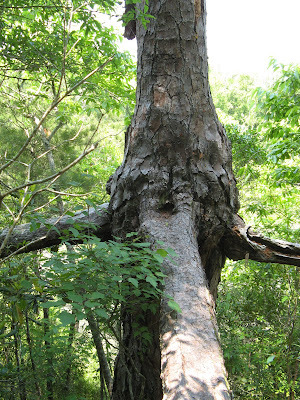 If I were a lizard, I would live in this tree, too - It had an amazing view of the river. Covered in bug repellent and sweat, next was Torreya State Park itself, where I hiked some lower trails down near water-level of the Apalachicola River. Although only a few miles down the road, the trails were totally different. 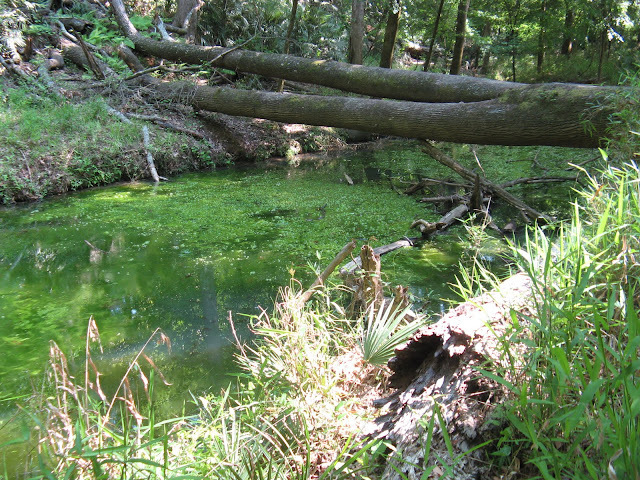 That area resembled more swamp and jungle. It was pretty darn cool. I felt like a jungle explorer. Big slimy looking algae bubbles were everywhere on the water... little schools of fish were hanging out along the bank, and there was a lot of buzzing, chirping, and tweeting to be heard in all directions. So to any of those like myself, who also believed Florida to be flat - See it with your own eyes at both the Garden of Eden Trail and Torreya State Park. After a couple hour drive to the south, Tuesday was mostly spent enjoying the warm weather with a Weeki Wachee Springs riverboat ride and several mermaid shows! lol. ﻿I've never seen anything like it in my entire life, and I must say, I enjoyed it immensely. 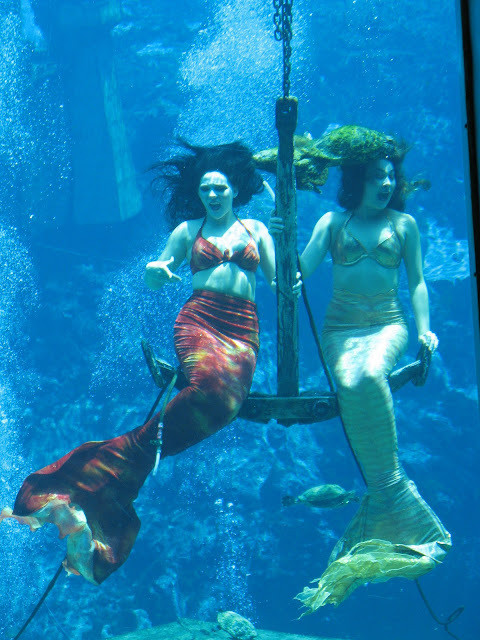 The mermaid shows were in an underwater theatre, and the mermaids were just incredible to me. 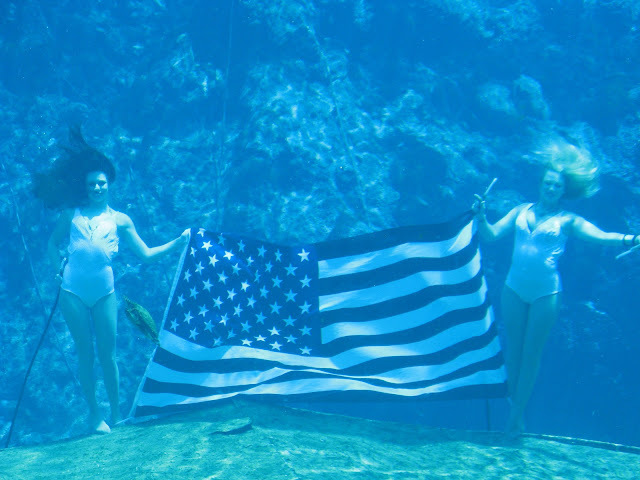 To be able to do what they do, underwater, with the occasional use of air tubes to breathe... it blew my mind. Not to mention, it was incredibly beautiful and relaxing to watch. 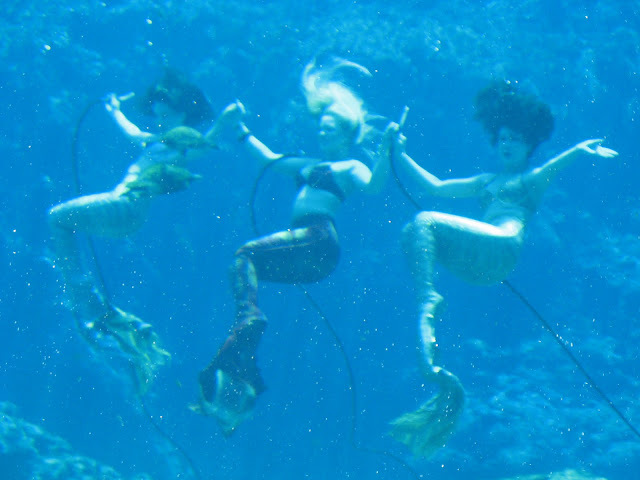 I will definitely be going back to Weeki Wachee in the future, hopefully taking someone with me that has never been there before. Gotta run! Laundry is done. I've been at a laundromat near Lithia Springs all morning. Gonna grab my laundry and head back to Lithia Spring Park, where I spent the night last night, to do some more snorkeling and fish chasing. Looks like another beautiful Florida day. So glad to be missing the snowstorm in the north right now! Go to homosassa springs and see the Manatee's! 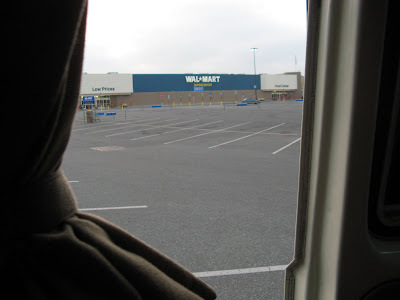 Glad you are blogging again. thebigyoc. so awesome. i'm gonna have to see this garden of eden trail someday soon. an amazing adventure. Possibly a must for van dwelling fun. Check out the Challenger K1 inflatable kayak on Amazon.com. Super strong and easy to pack and use. Can't beat the price at 80 bucks with free shipping. Comes with a cargo net on the front of the kayak to store extra for the trip, includes paddle,pump and storage bag. Have fun! I grew up in Florida and have no seen to that park. Definitely adding the Garden of Eden trail to my list of things to see soon. So you lived in your VW for how long? I'm impressed. I have an old VW (not a westy though), and it can be a pain to keep running sometimes. And you've seen more of Florida than I have, and I've lived here my whole life!